This is a busy chart but oddly enough it is hard to get good historic info. This is from Brian Ripley at www.chpc.biz . and is updated to today. Houses have changed in size over time so now you get a bigger house than you would have gotten, say, immediately after WW2. We will ignore all those niceties and just concentrate on the big picture. Notice that a SFD (single family dwelling) cost around $350m only 12 years ago. Today that is $750m or double that plus a bit. Income over roughly that same period rose by just 31%, a lot less. 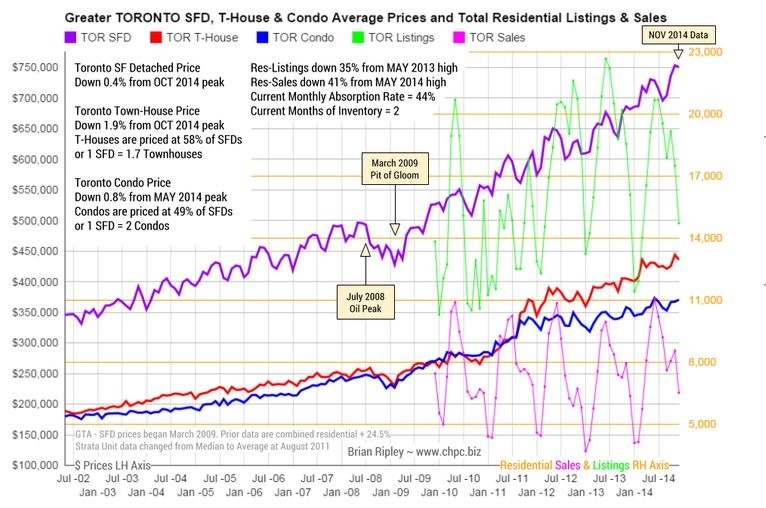 If I am not mistaken family income in Toronto is in the neighbourhood of $70,000 per annum which would put the price to income ratio at about 10X (the norm, over centuries is about 3x). In other words locals cannot afford to live here, unless they moved in 10 years ago, inherited from their parents and or are bankers, judges or the like. The Bank of Canada came out today to tell the world that they now have a model. As if that was not amazing enough the Governor explained, with a straight face, that according to the model house prices are in fact overvalued, possible by as much as 10 to 30%. 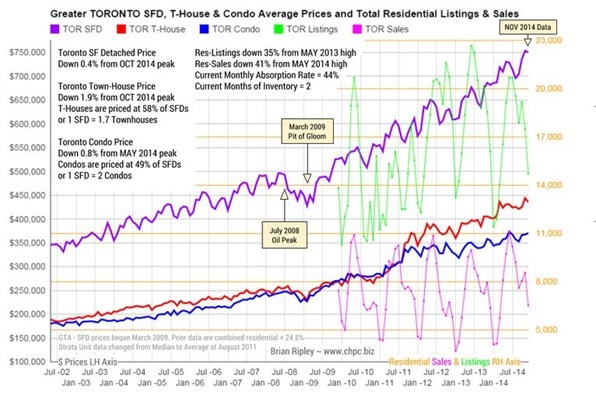 This in contradiction to earlier ramblings by the CMHC, Remax, Real Estate Board, OECD, RBC etc etc. all of which did not see any problem at all from their disinterested vantage point. Not to worry though as the Governor went on to explain that this model has a risk-meter built into it and surprise, surprise, the needle on the meter shows a diminishing risk. None of the academics working at the Bank of Canada were of age when half of Calgary was on the market under power of sale back in 1989. It is an economic risk, not a financial risk so they say but the difference will be less clear when the oil glut comes home to roost. In EW terms a correction of an exuberant market invariable takes prices back down to the last kink on the way up, that is a minimum. Here that would be about $450m in 2008 just before the great recession which would be about 40% down. This could happen even without any measurable increase in interest rates simply due to loss of employment or reductions in pay, immigration etc.etc.Fortunately the Bank has looked into this and is confident that this will not happen. It is good to have a dream.